REPEAT REPEAT MEDIUM JUG -The Plum Jugs are available in four different sizes, each with a different pattern. They look great when displayed as a set. 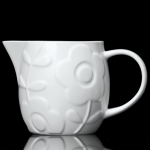 The jugs mix and match splendidly with our other white bone china ranges. This mug-sized jug is perfect for milk, cream or even juice. Holds approx. 1/2pints, Dishwasher and Micrawave safe.